Puzzle Strike is a game for 2, 3, or 4 players with a lot of back-and-forth craziness and wild combos. It's played with chips instead of cards because they're easier to shuffle. Choose from 10 Fantasy Strike characters (all included), each with three ability chips. Games should take 20 or 30 minutes once you have the hang of it, and even your non-gamer friends will probably enjoy it. A deck building game with pogs (chips) instead of cards. The concept is neat, especially for people who dislike the shuffling involved with standard deck builders (Dominion, Thunderstone, etc). Your chips act the same as cards, giving you all of the information you need. Another major difference from previous deck building games shows itself at the beginning. Instead of every player starting with the same deck of cards, the players begin with a character who has 3 unique character chips that fit the theme of the character. You can be a traditional martial arts master, a shapeshifting (dragon) master teacher, a gambling panda, rock golem, aquatic shaman, and more! Each of the ten characters have a play style that fits them best, from extremely defensive, to all out offensive, with risk taking specialists sprinkled in. This asymmetric start will appeal to many, as it increases variety and replayability. Puzzle chips take the place of kingdom/village cards, and give similar variety to what we’ve come to expect in deck building games. Each player using a different character helps limit the fear of there being one optimum path to victory that everyone rushes for in a given set of chips. The other major departure from games in this genre is the winning condition. Instead of building up victory points, you’re simulating a puzzle fighting game, attempting to be the last character standing. You are sending (crashing) gems (which also act as money) from your gem pile to an opponent, who in turn is either trying to counter-crash the gems back at you, or send gems from their pile to another opponent. If your pile builds up too high, you’re out of the game. This results in a player elimination game, but the relatively quick end to the game once players start to be eliminated limits player downtime much better than other player elimination games such as Risk. One downside to the game is the initial balance to the characters. In games where everyone starts with the same cards, the game balances itself. When each person has a different character, extreme care is needed to ensure the characters are balanced. The work done on balancing the characters is both a boon and a curse for this game. Significant work has been done to balance the characters, but it appears that as the game has reached a wider audience, the game has needed some rebalancing. Thankfully, the designer and playtesters have been working to ensure that balance is met. Unfortunately, this means that currently, the chips in the set may not be completely even. There are suggested changes to certain chips and characters to help alleviate this problem. Currently, many games seem to follow a pattern of ignoring many of the puzzle chips and focusing on purple chips, which allow combining and crashing of gems in you gem pile (somewhat analogous to the Big Money strategy in Dominion). With the work going on to shore up these concerns, and the fun diversion from the typical deck building games, I think Puzzle Strike will definitely stand on its own, it just appears it will take a little more time to get there. If you like deck building games, it is worth giving Puzzle Strike a try, there are interesting changes that are sure to intrigue you! In the age of mindless iPhone apps and Facebook mini games, having a board game that simulates a simple puzzle game seems like a gimmick. 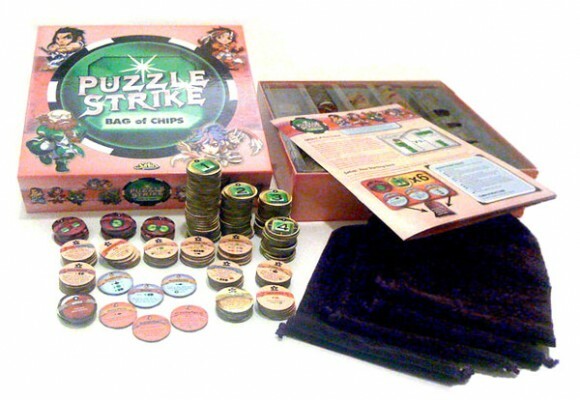 However, Puzzle Strike has uncovered the fun of the puzzle game and wrapped it around a deck-building mechanic to produce a wonderfully fun and engaging board game. 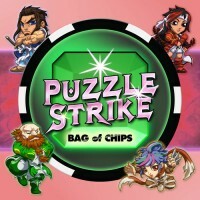 In Puzzle Strike, players take the role of a fighter, attempting to take out their opponents by overflowing their gem piles. Players can collect and eventually crash these gems, sending them to their opponents. Each fighter has unique abilities that are augmented as the game advances by puzzle chips that help the fighters attack their opponents more effectively. Puzzle Strike is greatly re-playable as it comes with 25 different puzzle chips, only 10 of which are used in any particular game. In addition, 10 different fighters can be found in the game, each of whom plays a little bit differently. I love Dominion. Who doesn’t? But when I acquired Puzzle Strike Dominion started hitting the table less and less. Puzzle Strike shines because of the player interaction mixed in with the Dominion formula. If you like Dominion but want to interact more competitively with your opponent, you should give Puzzle Strike a shot. I am a fan of the console game this is based on (Puzzle Fighter), and I think the designer hit the feeling really well. There’s a few issues I have with the power of some of the chips, but an upgrade pack and expansion are in the works which seems likely to give it even more legs! This is an amazing game. It offers a lot of unique strategy, game play effects and every game is pretty much a different one. One of the best games I’ve ever played and I find it to be one that I play very often. This game resembles the many different Bejeweled-type fighter games you see for various handheld gaming systems (PSP, DS, etc.). Players each select a character chip, a little money and your characters three unique chips. After this, you will go about buying chips from the bank to add to your deck, while you try to crash gems that are sitting in your gem pile. At the start of each round, you get 1 gem. The objective, of course, is to fill your opponents gem bank to 10 or more gems. The game offers a lot of unique customization, and your play strategy will change with different bank set-ups and different character chips. While definitely not for everybody, it provides a unique spin on the Deck Building Genre. I have played this a couple times and have never wished someone would win so much in my time gaming. I found it too similar to Dominion and the interactivity it added didn’t make it more enjoyable to me. I also did not like the chips instead of cards. Cards just feel natural in my hands. Components seem good quality though not sure how they will hold up to tons of play as you can’t really sleeve them. Add a Review for "Puzzle Strike"